Join us for an unforgettable trip of a lifetime on a boat out at sea to swim with wild dolphins. Get into the water with snorkeling equipment and observe and interact with wild dolphins in their natural environment. If you have been wondering if you can visit South Africa, swim with dolphins, swim with whale sharks and rays, as well as do a safari to see Africa's wildlife, the answer is yes. We are based in South Africa and offer a variety of tour options including our dolphin adventure where you can swim with dolphins, do turtle tours where watch giant sea turtles, safaris to Hluhluwe-iMfolozi Park, Tembe Elephant Park and the iSimangaliso Wetlands Park. We also offer tours and safaris to other parts of South Africa, Swaziland and Mozambique, Botswana, Namibia and Zambia. The swim with dolphins trips leave from St Lucia and head up to southern Mozambique, where we get onto a boat , head out to sea searching for wild dolphins to swim with. When we find dolphins, we enter the water gently and watch them in their natural habitat, doing what dolphins do. If you are going to be visiting KwaZulu-Natal in the Northern part of South Africa, a swim with dolphins is an experience not to be missed! The weather is sunny and warm all year round with ocean temperatures ranging from 22'C in the winter to 28'C in the summer. The waters are clear which allows one to get fantastic sightings when you swim with the dolphins. The dolphins are NOT IN CAPTIVITY, they swim free in the ocean, so the dolphin or dolphins actually swim with you, and it is on their terms! Before you get into the water you will be briefed about the trip, the boat and what to do and not to do while you are swimming with the dolphins. In the next section below there is a list of things you should and should not do when you swim with dolphins. The dream of so many! But firstly, ethics. Is it right to swim with dolphins? When people swim with dolphins, are the dolphins disturbed in any way? Is it detrimental to swim with dolphins? Much has been written about the ethics of swimming with dolphins, mostly by people who have never had a swim with dolphins. I have personally spent many hours in the water swimming with dolphins in South Africa and elsewhere, and these are my feelings about the subject from personal experience. I am not speaking of dolphins in captivity, I won't even get into the ethics of keeping animals in captivity in this article, but interacting with other species in their natural habitat is a different matter. When you encounter dolphins in the great expanse of the ocean, whether it is while sailing, surfing, swimming, free diving or scuba diving, it is the dolphins choice to interact if they want to do so. I have been surfing on many occasions where dolphins have approached me and even shared waves with me, circled around for a few minutes and moved on. If you are on a boat and you jump into the water with wild dolphins, they will swim away, and no matter how fast you swim, you will not cause them any mental anguish! That said, there are strict guidelines for swimming with dolphins and how you should behave if you do encounter dolphins in the water: Never approach the dolphins when they encounter you, they will just swim away. Keep eye contact, dolphins are as curious about us as we are about them. Keep your arms at your sides and don't kick and splash while swimming with dolphins. Do not try to touch the dolphins while you are swimming with them, respect their space. If the dolphins want to touch, they will brush past you. Most importantly of all, relax and enjoy! Animals have been used along with physical therapy for decades. It is common to see small farms or petting zoos double as places for assisting those who are in need of mental or in some cases, physical therapy. There is also a new trend for such physiotherapy. Humans have been swimming with dolphins for decades. It seems that only in recent years have researchers noticed how the dolphin interacts with those who have special needs, and the science of dolphin therapy has evolved. Dolphins have it in their nature to be curious and sociable. Their lesser known traits are patience and an inner sense of their environment. Physiotherapy researchers noticed that dolphins seem to exhibit an extra degree of protectiveness towards individuals who are physically disabled. Pregnant women are also known to receive extra attention when they swim dolphins. Dolphin therapy Researchers are careful to emphasize that the results will vary for each individual. The results of their studies continue to reflect amazing potential. Non-verbal individuals have often spoken their first words to dolphins or during a swim with dolphins. Seemingly in-affectionate individuals have gradually learned to cope or even show affection after swimming with dolphins in dolphin therapy sessions. Dolphin therapy studies have also showed some patients developing greater motor skills when introduced to dolphin assisted therapy where they swim with dolphins. Cancer patients have found relief from the emotional isolation they may feel by swimming with dolphins. Patients with multiple sclerosis and autism have all responded positively to interaction and swimming with dolphins. Dolphin assisted therapy, also called DAT, is most often conducted with the help of a marine biologist as well as a physical therapist. The individual receiving the therapy is given the standard physical exercises, but they are allowed physical contact while swimming with the dolphin at the same time. Scientists are currently exploring the use of dolphins in a therapeutic setting. There are no guarantees of results when using dolphins as with any other animal. The dolphin's 'healing' powers have been attributed to a range of factors, but a swim with dolphins will never be detrimental. Some theories believe it is merely the dolphin's affection and tolerance that brings such positive results. Other studies suggest that the dolphin's natural sonar actually triggers a healing response from within the human body. When a dolphin swims, it is so graceful and it exudes joy and evokes joy. Advocates of dolphin therapy cite many areas of improvement for patients. 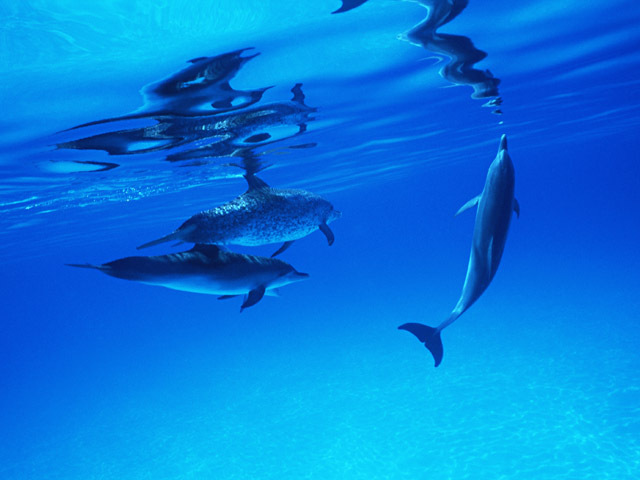 Many believe that a regular swim with dolphins can boost the immune system. Some state it can increase learning capacity from 3 to 11 percent. Advocates also believe this learning capacity brings a knowledge retention rate of around 50 percent a year, so swim with dolphins and get smarter! Reports have been submitted for years that dolphins have helped humans who have got into trouble while swimming in the ocean. These include such acts as offering protection against sharks to dolphins pushing injured swimmers safely to shore. When you consider their biology it is easy to see how dolphins may associate humans with their own kind. Dolphins swim in groups that are called pods. They carry one offspring at a time and nurse them after birth. Dolphins are warm blooded like humans. They protect and care for one another just as humans do. After a baby dolphin is born, the mother and baby dolphin swim close and keep physical contact. The baby dolphin has whiskers with which it feels the mother's slipstream in order to stay close to her. When they sleep, the mother and baby dolphin swim in a tight circle, the baby dolphin swims on her inside for protection from predators..
Dolphin assisted therapy usually occurs in a captive dolphin facility, but disabled individuals with mobility or even those who can't swim are usually treated to swimming with dolphins with assistance and flotation devices. Dolphin assisted therapy is not a promise of success. It does offer the potential to bring much joy into the lives of the disabled. These caring and gentle animals of the ocean can urge development in areas that may not see stimulation in other circumstances. Click here to Contact Us for more Details about our non-profit Dolphin therapy packages.